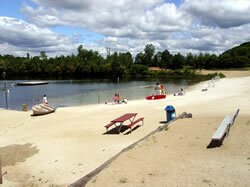 Get in the swim of things at Randolph Park Beach! May 26 - June 17: Open weekends for swimming 11 a.m. to 5 p.m.
June 25 - August 25: Open daily for swimming 11 a.m. to 7 p.m.
August 26 - September 3: Open daily for swimming 12 noon to 5 p.m.
limited to members and Randolph residents only. A beach membership is a great way to enjoy a full summer of special events and family activities. Who needs the Jersey Shore when you’ve got the Randolph Park Beach? Don’t spend your summer stuck in traffic…spend it at the municipal beach…all the fun without the tolls and traffic headaches! Memberships for senior citizens are free with a Randolph Senior I.D. Card. Seniors must register for beach membership and will receive a photo ID card. Randolph residents receiving public assistance or in the military may also qualify for a free membership. Please contact the recreation office at 973.989.7081 for more information. New members will be receiving new membership cards this year. New cards will be processed the first day you visit the Randolph Park beach. IMPORTANT: In order to receive a new beach membership card, you will need to provide identification. For kids under 17, a birth certificate will suffice; adults should bring a driver’s license or voter registration card. Immediate family only; no more than two adults per account. The Randolph Park Beach membership card is a non-transferable photo ID. Everyone must have a properly validated membership card in order to gain admission to the beach. The exception to this is pre-school children and visitors who have paid the guest/daily fee. Randolph residents and non-residents can visit our online registration site to purchase beach memberships, fishing badges and boat passes. Registration, payment, card validation and photo-taking can all be done at the Randolph Park Beach seven days a week between the hours of 12 noon and 4:00 p.m.
Misplaced or lost your membership card? Not to worry. Provide identification and pay a $6.00 replacement fee and we’ll have you back on the beach in no time.